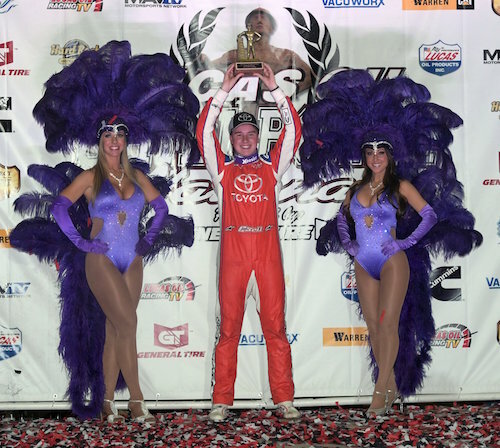 NASCAR Xfinity Series driver Christopher Bell claimed his third-consecutive Chili Bowl Nationals win Saturday night with a last-lap pass on fellow-NASCAR driver Kyle Larson, who was looking to take his first win of the yearly, nearly week-long, indoor dirt Midget event at the Tulsa (Okla.) Expo Raceway. Larson finished second after the last-lap physical battle between he and Bell. The last lap was the only lap Bell led in the 55-lap A main. Justin Grant, Brady Bacon, and Zac Daum rounded out the top-five of the A main. Another NASCAR driver, Ricky Stenhouse Jr., wound up 21st in the 24-car race. The more than 300 drivers that competed in the 2019 Chili Bowl also included NASCAR drivers Alex Bowman, Justin Allgaier, Tanner Berryhill and Chase Briscoe, none of whom advanced to the A main. Briscoe got to the B main, but the others failed to advance beyond the C main. Both Larson and Bell advanced to the A main with feature wins earlier in the week. Larson won a preliminary race on Tuesday, while Bell was a winner Thursday.